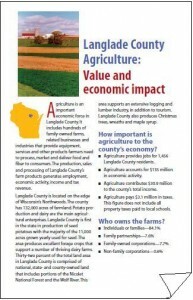 Agriculture is an important economic force in Langlade County. It includes hundreds of family-owned farms, related businesses and industries that provide equipment, services and other products farmers need to process, market and deliver food and fiber to consumers.The production, sales and processing of Langlade County’s farm products generates employment, economic activity, income and taxrevenue. Langlade County is located on the edge of Wisconsin’s Northwoods.The county has 132,000 acres of farmland. Potato production and dairy are the main agricultural enterprises. Langlade County is first in the state in production of seed potatoes with the majority of the 11,000 acres grown yearly used for seed. The area produces excellent forage crops that support a number of thriving dairy farms. Thirty-two percent of the total land area in Langlade County is comprised of national, state- and county-owned land that includes portions of the Nicolet National Forest and the Wolf River. This area supports an extensive logging and lumber industry, in addition to tourism. Langlade County also produces Christmas trees, wreaths and maple syrup.